Pallet Rack Bumpers | Ace Industrial Equipment, Inc. Warehouse racking can be expensive and protecting that investment is important. 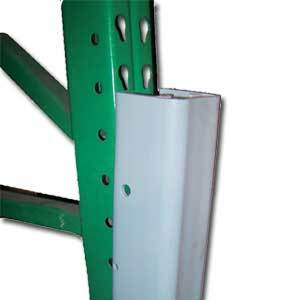 Using bumpers for the pallet rack or other industrial racks is important. Pallet rack bumpers help prevent damage to the lower portions of the rack in the event it is struck by a forklift or damage in some other way. Our rack bumpers are constructed from durable materials to ensure years of service. The rack bumpers are attached different ways but usually strap to the rack and get anchored in the floor. For more information on our pallet rack bumpers, rack guards, and more from our rack protector selection, call 1-800-300-6034 Monday thru Friday 8:00 to 5:00 E.S.T. We proudly serve companies in Louisville, Birmingham, Miami, Tulsa, San Antonio, Kansas City, and in all other cities nationwide.